If you’re looking for boredom busters to keep your little ones busy when you’re cooped at up home, but don’t want to spend a small fortune at Michaels or Hobby Lobby, this collection of dollar store crafts and activities is exactly what you need! We are currently under an extreme cold weather warning here in Toronto, and while there’s tons of snow on the ground for the kids to play with, it’s simply too cold to spend prolonged periods of time outside. This is both a blessing and a curse for parents – it saves us from freezing our bums off, but also leaves our little ones climbing the walls on Saturdays and Sundays. And that’s where this list of dollar store crafts and activities comes in. 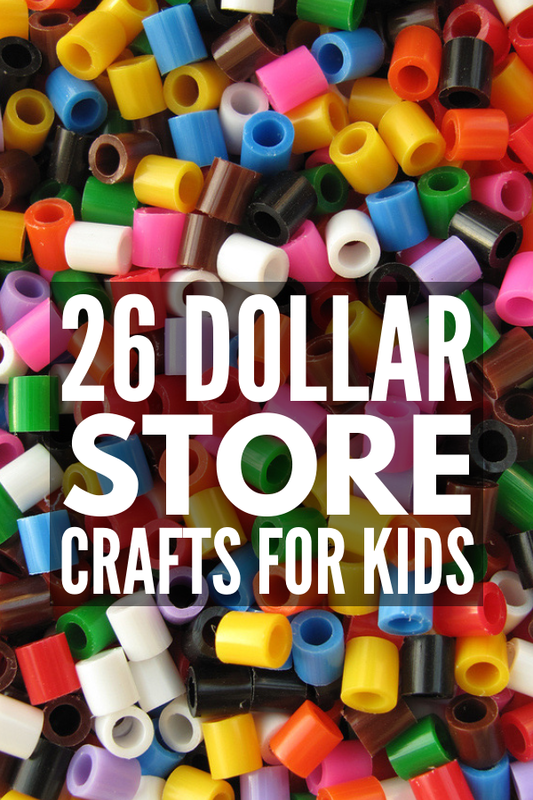 I learned many years ago how much kids LOVE the dollar store, and I love that we can stock up on craft supplies for a fraction of what I would pay at the bigger box stores. So whenever the weather is bad, my daughter and I head on over to Pinterest to find the latest and greatest dollar store crafts and activities. We go through the crafts we want to try in detail to determine what supplies we already have on hand, and which ones we need to buy, and once our shopping list is complete, we bundle up and head to our local dollar store. I admit that I’m not really a fan of spending my Saturday afternoons at the dollar store, but my daughter loves it and it gives us an opportunity to go for a drive so we can listen to some tunes and reset our moods on days we’re stuck indoors. Keep reading for some of our favorite dollar store crafts and activities! I thought it would be helpful to include a master list of all of the supplies needed to make the activities I’ve included below. I realize not everyone likes to make multiple trips to the dollar store like us – LOL – and it can be really helpful to have a stash of dollar store craft supplies on hand for days you’re stuck inside and desperate for activities to keep your kids occupied! I was careful to curate multiple crafts that use the same supplies to maximize the use you get out of each, and for those who don’t live close to a dollar store and/or prefer to do their shopping online (no judgement here! ), I included links to each product on Amazon so you can order everything from the comfort of your living room. And now for the fun part! The list above covers every single one of the dollar store crafts and activities below, providing you and your children hours of fun when you’re cooped up inside. I hope this collection of dollar store crafts and activities keeps you and your kids occupied on bad weather days, and that they inspire you to find more ways to have fun at home throughout the year. Remember that you don’t have to spend a fortune on toys and games to spend quality time with your kids – you just need to find fun and meaningful ways to connect with them. If you enjoyed this collection of dollar store crafts and activities for kids, please share this post on Pinterest! And if you’re looking for more ways to have fun at home with your little ones, please follow our Kids board where we share all kinds of fun ideas we find each day!